Your air compressor pump should never be chosen hastily based on size and price alone. 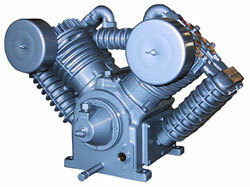 The right compressor pump is vital to the energy efficiency of your machine, and the wrong one can be quite costly. If you purchase a pump that is too large for your machine, you could find your compressor’s energy consumption skyrocketing. Furthermore, if you purchase an inexpensive, inferior brand, your machine may also not run as efficiently as it should. Not to mention the fact that substandard air compressor pumps tend to have a considerably shorter life. Let the compressor specialists at A&W Compressor evaluate your machine and the needs of your particular operation to find the perfect air compressor pump for you. Pneumatic tools – blow guns, air hammers, etc. We have been in the compressor business for more than 25 years, so we know how to keep air compressor systems running smoothly and efficiently. Whether you own an industrial reciprocating compressor in Nashville or a rotary vane compressor in Knoxville, we have the air compressor pump you need. We also offer ambient air pumps for those who work in hazardous breathing conditions. To find out more about our selection of air compressor pumps and other replacement parts, call or e-mail A&W Compressor today.